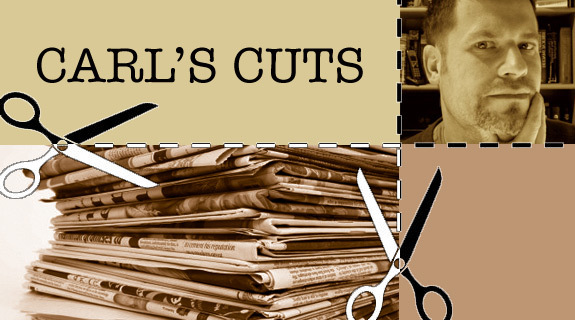 A lightning round of Carl’s Cuts is here, and for a special low, low price: free! But only until the end of time. • Let’s begin with a cutting quote from Scripture: “He who sends a message by the hand of a fool cuts off his own feet and drinks violence” (Prov. 26:6). Apply to current events as you wish. • More than once, in the past few days, I’ve read pieces that either state openly or imply the following: John XXIII was a liberal and John Paul II was a conservative. I’m going to quickly analyze that basic premise, so please try to keep up. Here goes: That’s not only stupid, it’s meaningless. It’s lazy and dull. The only thing it accomplishes is the politicization of Catholicism, which is only helpful for those whose true faith is in politics, not Jesus Christ. A witness to the horrors of Nazism and Communism, Pope John Paul II saw first-hand the physical and spiritual destruction wrought by the disordered desire to remove God and make man the center and meaning of history. He has also observed destuctive impulses in the West, falsehoods evidenced by the steady growth of abortion, contraception, amorality, and hedonism during the past several decades. In addressing all of these conditions, the Holy Father has consistently pointed out that man, in his confused search for identity and meaning, unwittingly proves he does indeed have a purpose and reason for living. The yearning of man, so often realized in distorted and ugly ways, is to be God and to be deified. John Paul II denounces the many perverted forms this yearning takes, but acknowledges its authentic core. Man has a God-made hole in his being, a deep recess which can only be fulfilled in one Way and by one Person, Jesus Christ. In the Incarnation, God united himself to man, making possible the unthinkable: intimate communion between the creature and the Creator. “This union of Christ with man is in itself a mystery,” the Holy Father states in his first encyclical, Redemptor Hominis, “From the mystery is born ‘the new man,’ called to become a partaker of God’s life, and newly created in Christ for the fullness of grace and truth.” (RH 18.2). This “partaking” of God’s very life (see 2 Peter 1:4) is the reality of divinization, or deification. In the Eastern Churches it is often called theosis; it is a central focus of Eastern Christian theology and worship. It is also one of the consistent and unifying themes of John Paul II’s thought, appearing often in his important trilogy of Trinitarian encyclicals – Redemptor Hominis, Dives in Misericordia and Dominum et Vivificantem – respectively on the Son, the Father, and the Holy Spirit. Continue reading on the Ignatius Insight site. This theme of theosis/divization in the writings of John Paul II is examined further in the book, Called To Be Children of God, to be published early next year by Ignatius Press, which Fr. David Vincent Meconi, SJ, and I edited together, and which features contributions from fourteen different authors. While contending with one kind of revolution in Poland, Wojtyla was also a key player in another intellectual battlefield. Between the years 1962 and 1965, he attended the Second Vatican Council as a Council Father and was one of those who made significant contributions to the renewal of the Church’s theological vision. His “input,” one might argue, was the kind of input John XXIII had envisaged when he remarked that he would like to open the windows of the Church and let in some fresh air. In particular, Karol Wojtyla made significant contributions to the document Gaudium et spes, known as the Pastoral Constitution on the Church in the Modern World. Cardinal Wojtyla was not one of these drug crazed hippies and Poland’s experience of the 1960s was very different from that of western countries on the free side of the Berlin Wall. He did not read Gaudium et spes as a call to accommodate the Church’s teaching or liturgical practices to whatever happened to be the spirit of the times. In his country, that would have meant some form of Marxism. For Wojtyla, Gaudium et spes was not a call to accommodate to anything, but rather a call to re-centre the Church’s teaching and pastoral life on Christ. It was also an attempt to present some of the Church’s perennial teachings in a more personalist, less scholastic, idiom. It is hard for persons in democratic societies to grasp how China’s party-state can control the fertility of China’s millions. The effort starts with a barrage of anti-child propaganda in the schools and workplaces, and then moves to open intimidation in banners and slogans posted in public places. Visit the PRI site to see photos of the banners and slogans. Thousands of Chinese Christians have united in the city of Wenzhou to form a 24-hour human shield around the Sanjiang Christian Church, amidst threats from the Communist authorities to demolish the building. The three-story Church is one of ten places of worship to have been listed for demolition in the Zhejiang province, considered China’s most Christian region. This is the second time in two weeks the Christians of Zhejiang have flocked to protect their Church from the machinations of the local Communist party. Read more and see pictures of the demolition. • I, for one, am thankful that I live in a country whose government does not encourage abortions and would never think of targeting Christians in any way. Or something like that. Reading Dawkins challenged me to go beyond my comfort zone and honestly confront the issues holding me back from a full commitment to faith. My sense of The God Delusion is that it is written as a testimony to Dawkins’ belief system (which I call fundamentalist atheism) and that the author cherry picks convenient quotes to bolster his opinion that esteemed scientists (such as Einstein) couldn’t possibly be ignorant enough to actually believe in a supernatural God, no matter what they may have said to the contrary. In fact, anyone with any intelligence at all couldn’t possible believe in a supernatural God. Dawkins is preaching to his atheist choir and evidently they loved the book based on their many five-star recommendations of it. But in that sense, Dawkins is no different than the many Christian authors who write in a similar manner. There is a pre-judgment that whoever disagrees with the premise of the book is, essentially, an idiot! Well, I don’t like to be called an idiot. I realized I was no better than Dawkins. … And that was the beginning of the last leg of my journey to conversion to Catholicism. In reading to refute Dawkins as well as educate myself and find answers to questions, I discovered the God-man Jesus Christ. Not only did the Catholic view resonate with me emotionally, but perhaps more importantly for me, it was intellectually honest. The Telegraph‘s Damian Thompson has a very similar anecdote about a friend who had been an atheist for many years. Nearly a decade after the end of his pontificate, Catholics are divided over John Paul’s conservative stances on birth control, priestly celibacy and homosexuality. As a Jew, Mr. [Gilbert] Levine has no stake in most of these intramural Catholic arguments. And, no, it wasn’t Rev. Wright’s church, for those who are wondering. • The Irish Independent reports that an Irish prelate, Abp. Diarmuid Martin, is “open to dialogue on the ordination of married men after Pope Francis signalled the need for the Catholic Church to discuss the issue.” But, the newpapers adds, Abp. Martin has indicated “that ordaining women into the church to make up for the shortage of priests was ‘not on the table at the moment’.” That’s good to know, I suppose, considering that the Church teaches that only certain men can be priests, period. If the quote is accurate (perhaps it has been tweaked), it’s a ridiculous thing to say, as Dr. Edward Peters explains. • Who said it? “Abortion compounds the grief of many women who now carry with them deep physical and spiritual wounds after succumbing to the pressures of a secular culture which devalues God’s gift of sexuality and the right to life of the unborn.” That was Pope Francis, in remarks made to African bishops a few days ago. And guess what? Very few people seemed to notice; it was essentially ignored outside of some Catholic media outlets. Go figure. Sometimes leaders can be remarkable in certain ways and then make a mistake so spectacular, it overshadows other historical achievements. Lyndon Johnson deserves to be secularly canonized for his work on civil rights but he never will because of the war in Vietnam. His defenders say that the pope was kept in the dark and that he believed that the accusations [against Maciel] were phony ones, like the efforts to slime the church in his homeland, Poland, during the Cold War. Personally, I’m waiting for Dowd to start bearing down on the abuse epidemic going on in public schools, and demanding that every POTUS of the past forty years be either jailed or mocked for failing to address it. The strict hierarchical structure of the Roman church means accountability goes straight to the top. The buck stops at the pope’s desk, for good or for ill.
Canonizing pontiffs from the era of abuse is not only tone deaf but also exposes a continuing, stubborn refusal to acknowledge the institutional coverup that occurred for decades and that those at the highest levels — including popes — didn’t do enough to prevent the crimes, enabling the crisis to continue. Thomas McDonald responds: “Was the abuse scandal horrible? Of course. Were there things the church could have done differently? In retrospect, that’s obvious. Does it mean that these two holy men are not now with God? Only a fool would argue so.” Exactly. The odd thing is that neither Down or Decker mention how much Benedict did in his relatively short pontificate to address the “filth” (as he famously called it) in the Church. Actually, it’s not odd at all: Benedict was “enforcer of the orthodoxy” and so must be either denounced or ignored at every turn. Priests, Church officials, and Vatican insiders told me that the differences between the two men come down to personality, not principle, and that Benedict is delighted with the goodwill the world is showing Francis. He probably is. Yet when he was the arbiter of Church doctrine, he never missed a chance to declare that the Church was founded on revealed truth rather than personality, and that the world’s goodwill isn’t worth having except on the Church’s terms. 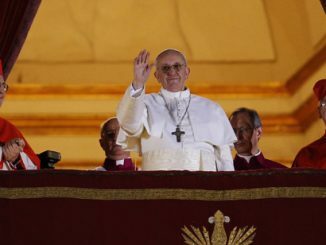 “Who am I to judge?”—Francis’s remark about gay people—was a sharp turn away from Benedict’s view that the role of the Church is to render judgment in a world in thrall to “a dictatorship of relativism.” Francis’s offhand statements and openness to new approaches make clear that he is a very different pope—and unless Benedict has lost his mind, he cannot be altogether happy about it. All revealed truths derive from the same divine source and are to be believed with the same faith, yet some of them are more important for giving direct expression to the heart of the Gospel. In this basic core, what shines forth is the beauty of the saving love of God made manifest in Jesus Christ who died and rose from the dead. In this sense, the Second Vatican Council explained, “in Catholic doctrine there exists an order or a ‘hierarchy’ of truths, since they vary in their relation to the foundation of the Christian faith”. This holds true as much for the dogmas of faith as for the whole corpus of the Church’s teaching, including her moral teaching. Elie is a talented writer, but until this recent piece, I was unaware of his great gift for fiction. Next. • Exhibit #3 lacks nastiness, but makes up for it in cluelessness: The Guardian‘s Sophia Deboick asked, “Must the Catholic church dehumanise John Paul II to make him a saint?” After reading her piece, I wonder, “Must journalists write nonsensical articles about the Catholic Church to impress their editors?” I suppose that John Paul II himself would find it quite funny that the Church’s celebration of his entrance into the divine life of God—which should be the goal and desire of every human—would be somehow viewed as “dehumanizing”! • Yes, Jesus had a wife. And still does, as Fr. Stephen Grunow reminds folks.